In the financial software battle for supremacy, Netsuite vs. Intacct aren’t your usual match-up because of the difference in each of the platforms’ capabilites. 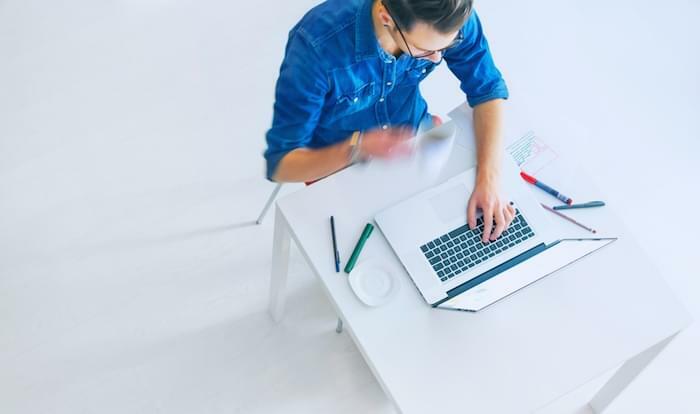 Oracle’s Netsuite offers several different products from a full-service ERP to separate business modules like accounting software you can purchase separately if that’s all you need. Sage Intacct is a core financial product with optional extra accounting modules available for specialized business needs. Both of these products are designed for large enterprise organizations or multinationals with plenty of working capital and complicated accounting and tax structures to go along with them. 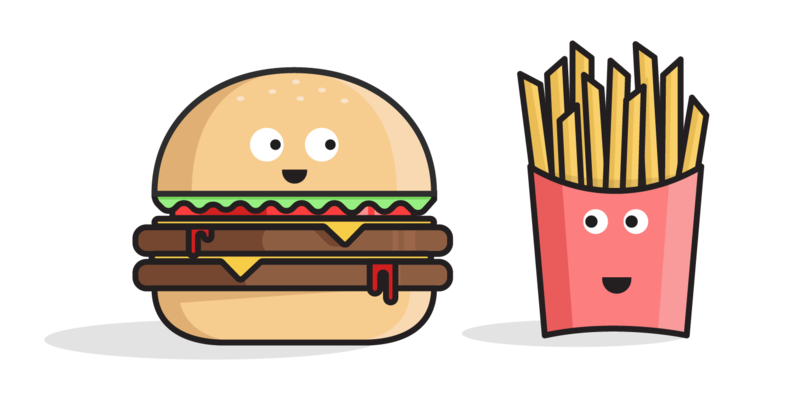 An SMB or startup would quickly find themselves overwhelmed with the number of features and price tag of either of these products. Neither Netsuite or Intacct comes cheap, but they are by no means at the top of the price list. And there are plenty of accounting and business financial software options available for companies of all sizes. Check out our Product Selection Tool for fast, free recommendations, or call a Technology Advisor now at 877-822-9526 for a free, 5-minute software consultation. Answer a few questions and our experts can match you with the right software. Netsuite has automated processes for both payable and receivables, giving accounting teams more time to work on the big problems of financials rather than poring over stacks of invoices and paper approvals. All of these automated workflows feed directly into the general ledger and larger reporting systems. Reporting and analytics make sure that no payment or invoice slips through the cracks. Intacct’s accounts payable lives in workflows, meaning no more manual processes to pay vendors, waiting on approvals, or budgeting. All of these are built into the process and items move quickly along the payment process to streamline payments and keep accounts up to date. The receivables software has similar automated features, but designed invoice quickly and automatically, when applicable. 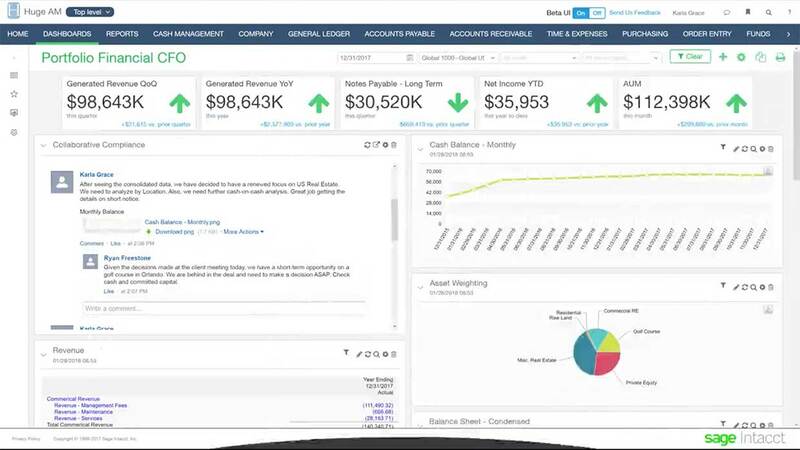 Intacct connects to CRM software and integrates your quote to cash processing. Built-in reporting gives organizations insight into their invoice cycle, deferred payments and real-time views of cash flow. Netsuite’s general ledger is flexible and supports multinational corporations and changing financial needs. All of the ledger is viewable in reports and dashboards that provide insight into real-time financials. Automatic entries are enabled with dynamic invoicing, and cross-book data checking means that a single entry in the General Ledger will appear in the associated books without duplicating entries and manual processes. Intacct provides multidimensional general ledgers that allow you to track required or custom dimensions for full insight into accounting. Dimensions extend to the number of individual ledgers you can maintain and combine at any time and the types of separate books you can keep to compare differing tax and financial statements. 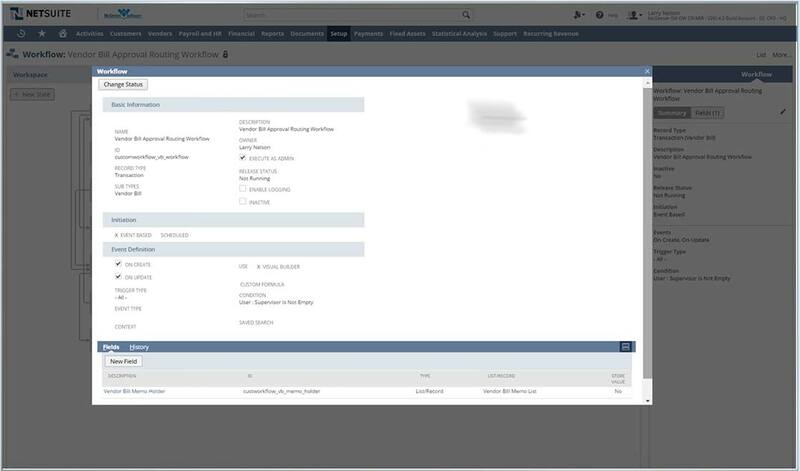 Netsuite does not include order management in the accounting suite, but order management is include in the larger ERP platform or can be purchased within the SuiteCommerce module. SuiteCommerce includes full B2B and B2C commerce features like ecommerce, CRM, order management and product content management. Intacct’s ordering program is built on the same point and click workflows that manage their payments and receivables. 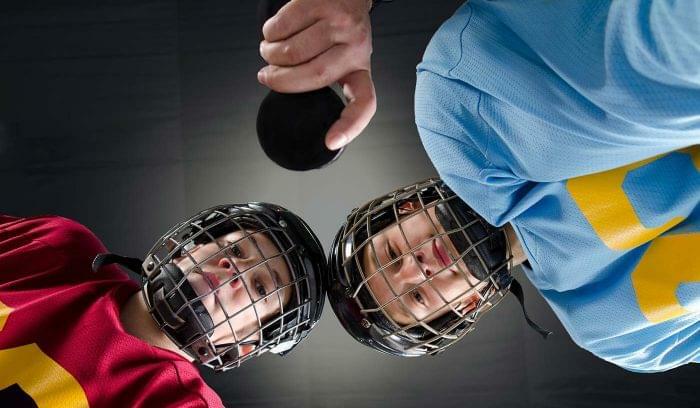 These workflows quickly move teams from manual order processing to an automated system that doesn’t require repeat work. Salesforce integrations give sales and accounting visibility into the entire process, and allows them to come to a central hub to agree upon pricing and terms. High-functioning reporting gives insight into inventory and fulfillment times as well as individual sales and representative behaviors that increase revenue. 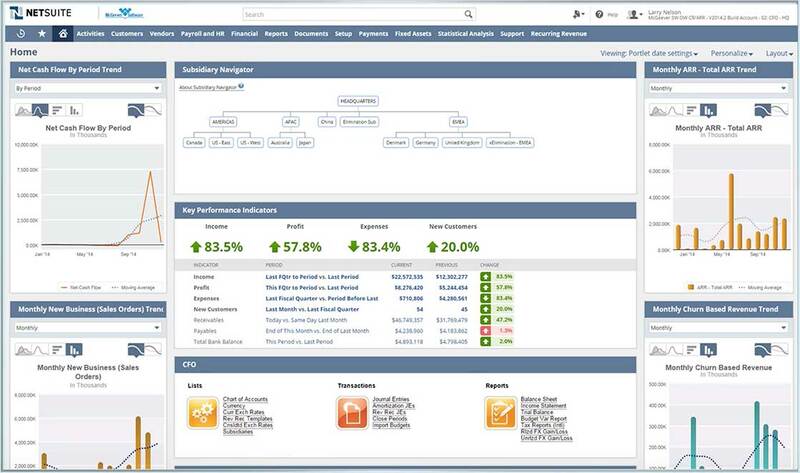 Netsuite has reporting dashboards that companies can set up for teams or individuals to follow their own goals and KPIs. Reporting is similarly flexible, with the ability to drill down based on custom dimensions or preset drill-downs. Based on Netsuite’s Dynamic GL, financial data can be categorized based on the company’s needs, and that data then translates into the reporting that matches the business need. Flexible report layouts make them easy to view on mobile and change for different presentation types. Intacct’s reporting comes with 8 preset dimensions you can use to visualize your financial data, plus you can add custom data to ledger entries to further drill down into your reports. The reports can also include operational data that affects financials but wouldn’t normally be found in the general ledger. Administrators can set up quick-view dashboards to show customized account, operational, and financial data for the full enterprise. Netsuite offers several products including CRM, Global Business Management, Business Intelligence, Customer Experience, and SuiteSuccess, their customer success platform. Each of these is available on their own with a full set of tools to set you up for success. Many of these products come standard in the full platform ERP. Because the product is so huge and contains so many features, Netsuite can be overwhelming for many customers. In contrast, Intacct offers basic core financial services, but provides lots of add-ons for more specialized business needs. Two of the most interesting add-on features are project accounting and time and expense management, both of which give teams better insight into how their money is spent and helps them avoid purchasing extra software that may or may not integrate directly with Intacct’s financial services. 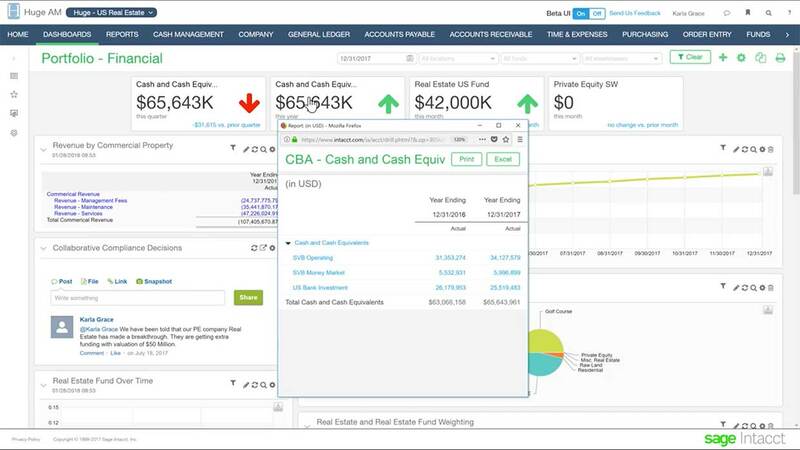 When looking at Netsuite vs. Intacct for your financials and accounting, you’ll want to take stock of all the features you’ll need from your accounting software. If you’re looking for an accounting software with scalable capabilities up to ERP and fully integrated systems, you’ll want to pay attention to what Oracle Netsuite have to offer. On the other hand, if your company’s growth is more measured and you need fewer features to get in the way of your core accounting, take a look at Sage Intacct. And if you still need help deciding, try our Product Selection Tool or give one of our Technology Advisors a call at 877-822-9526. They’re standing by to give you a free, 5-minute software recommendation tailored to your company’s specific needs.